Last week, Longmeadow Superintendent of Schools E. Jahn Hart announced the elimination of at least six teaching positions throughout the district for fiscal 2010. The School Department is currently working with a projected $31.2 million with $28 million coming from the town's general fund. Hart said she does not know what will happen with the layoffs. Editor’s Note: While the $31.2 million proposed school dept budget for FY2010 is $83,000 less than the FY2009 budget it does not include a COLA increase for teacher’s salaries. A 3% COLA increase could add $550,000 to the school dept FY2010 budget. Longmeadow Finance Director Paul J. Pasterczyk said the town is currently working with a $47 million budget. He said the town will take an estimated hit of $335,000 in the next fiscal year, much less than the anticipated $950,000. Town Manager Robin L. Crosbie said the governor's cuts will not have as big an impact on the budget as they expected. "We had already planned for deeper cuts, so this isn't as bad as we initially thought," Crosbie said. "The accounts that were targeted are not ones that we get a lot of money from. We do not get any additional assistance and only a small amount of lottery aid, so this has a fairly minimal impact on us." However, Crosbie said the town has to look at the future and the reduction in revenues. "There have already been drops in local receipts and because of that we have indefinitely stopped hiring for positions that have become open in town departments," she said. Editor’s Note: Hopefully, we may be getting some insight during Monday’s (February 2) Select Board meeting as to how the town plans to meet the expected shortfall in revenue for the current FY2009 budget estimated to be ~$400,000. However, looking at the SB meeting agenda, it doesn’t look like much time has been allocated for discussion of this subject. Given that the economic situation at both the state and national levels seems to be worsening, the town should anticipate and plan contingencies for still greater cuts in state aid and other town income as we move forward. According to the numbers posted today on the Massachusetts Dept of Revenue website, Longmeadow's state aid for the current FY2009 will be reduced by $169,442 which is higher than my original estimate of $146,000. Below are the official numbers for FY2009 (original), FY2009 (revised) and FY2010 (projected). Combining this number ($169,442) with the reduced excise tax receipts, lower investment income and overbudget snow removal costs (total = $225,000) that were discussed at the last Select Board meeting adds up to almost $400,000 which must be cut before the fiscal year ends on June 30. Looking to next year's budget... it doesn't get any better. Comparison of the original FY2009 state aid with the proposed FY2010 state aid shows a shortfall in revenue to Longmeadow of almost $500,000. According to Paul Pasterczyk, town finance director there is ~ $917,000 of "Free Cash" and approximately $2.13 million in the Operational Stabilization Fund. Both of these sources which are the town's reserves can be used to reduce the current deficit. While the FY2010 proposed school dept budget is $83K less than FY2009 (see earlier post), it does not include a "cost of living adjustment" or COLA for teachers since their contract ends at the end of the current school year. If a new teachers' contract were negotiated that provided for a 3% COLA increase, it would increase the proposed $31.3 million school budget for FY2010 by $550,000! The current financial environment suggests that the FY2010 budget process which has been underway for some time looks like it may be very difficult. The Longmeadow School Committee invites and encourages all residents to attend a public hearing on its FY10 budget on Wednesday, February 4 at 7 PM in the Longmeadow High School Cafeteria. This hearing provides residents the opportunity to listen, learn and provide feedback on the current and future fiscal challenges of the Longmeadow Public School system. The School Committee is proposing a FY10 budget of $31,239,339. This budget proposal reflects a DECREASE of over $83,000 from the FY09 Revised Budget as well as significant staffing reductions. 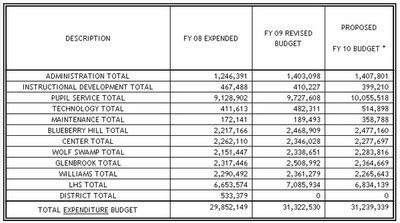 Please click the following link to view the DRAFT FY 2010 School Department Budget that was presented the School Committee during their meeting of January 26, 2009. * IMPORTANT –The current proposed budget is subject to change by the School Committee prior to the Budget Hearing and/or as additional information becomes available (i.e. town and state revenues, etc. ).